Create any kind of game using the CGA 4 color palette that fits the jam theme with 8bit/chiptunes sounds. You can Follow me at @DavitMasia to be updated about any rule changes or news related to this jam. You can start doing some mockups, testing the palette and set the shader to work with CGA mode and organize your assets/workflow. The theme of the jam will be announced one day before the jam starts, after that you can start to develop your game. Filters like: Noise, RGBA Channel separation, distorsion, Tv Flickering, scanlines... but remember to add an On/Off button. Also you can change between the CGA palette 0 and 1 ingame. NOTE: About "RGB channel separation" you can optionally use turquoise(#00FFFF) and pink(#FF00FF) instead of red/blue/green. Q: I don't understand one of the rules or i have some questions. 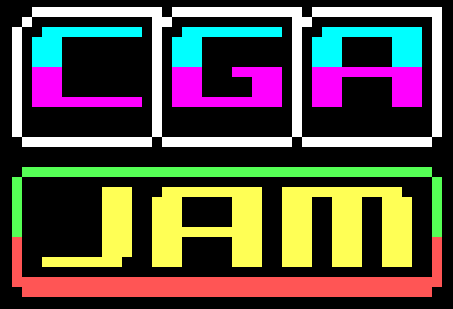 A: Please go to the community tab and leave a post on on "CGA Jam General" category. Defeat the Lich King - or die! Space exploration like you've never seen before. Populate an entire solar system by hurling Dinos at planets. Digital version of board game "Za Rulem"
Survive in the mountains north of the wild south! Mangoroment is an action game made for the cga game jam 2017. The "Hello World" of games with a twist! These succulents will succ your blood!!! Everything always comes back to you. These cowboy goodboys gotta transport the cows. Navigate the treacherous outskirts of space in search of the remarkable yet illusive material known as Cavorite. Speedrunner where history repeats itself. Be mindful of Volume, android and ios compatible. 3D tower climbing platformer! Build time - 2 weeks.